An experimental fruit beer brewed with dates is the latest release in the Friendship Series from Beau’s All Natural Brewery. 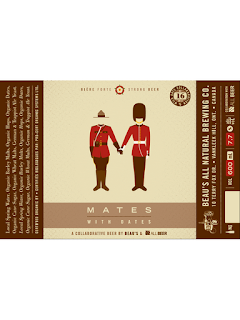 Called MATES... with Dates, it is a collaborative beer co-designed and brewed by Beau’s head brewer Matthew O’Hara together with British master brewer Alex Barlow. The beer will be available for sale beginning at 10 am, Thursday February 9. The unique creation went into the tanks when Barlow visited Canada as a guest speaker for Beau’s Oktoberfest event last fall, and has been aging ever since. Loosely based on a British brown ale, MATES was fermented a second time with Trappist ale yeast. Thirty kilos of organic dates made their way into the brew, and the creation has now aged several months. The result is a strong fruit beer (7.7%) that does not conform to any particular recognized style — although dried fruit and spice notes are dominant. The beer is fruity without any overwhelming sweetness, and finishes pleasantly dry. Barlow and Beau’s head brewer Matthew O’Hara will be attending launch events to introduce MATES… with Dates to the world, beginning with a “meet the brewers” event at the Clocktower Brew Pub in Ottawa Wednesday Feb. 9. The following evening Barlow and O’Hara will host a 4-course beer dinner at the Blueberry Hill Bistro in Vankleek Hill, each course paired with a different Beau’s beer. The brewers’ tour concludes in Toronto at Wvrst (609 King St. W), where Mates with Dates will be available on tap. Details of these events are available on the Beau’s All Natural Facebook page. Presales of MATES… with Dates have already begun online at www.bybo.ca. A very limited release, the beer will be sold direct from the brewery or online for home delivery in Ottawa only, in 600 ml bottles for $16 incl. tax and deposit.